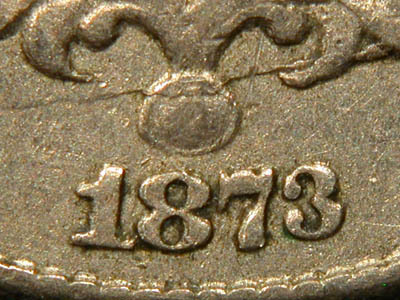 This 1873 is a monster doubled die that probably has the widest spread of any doubled die in the series. 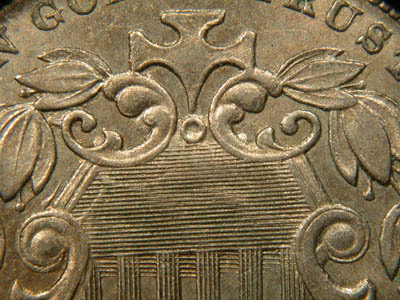 The secondary annulet is barely visible below and to the right of the primary annulet, buried in the horizontal lines of the shield. The extreme doubling can also be seen in the extra horizontal lines at the bottom of the shield. 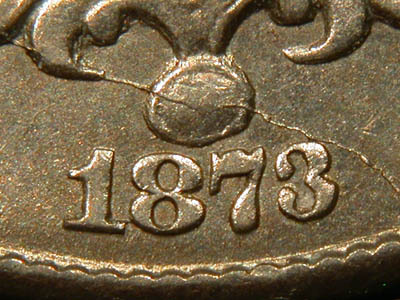 This is the date area of this coin. The reason for presenting will be apparent when you read the runner up. 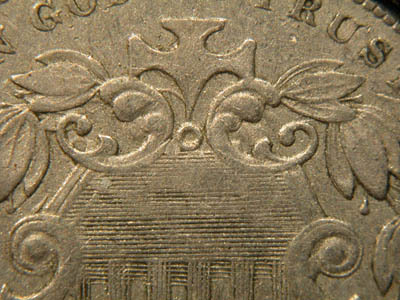 The runner up is another 1873 giant doubled die obverse - the doubling appears identical to the winner even down to the appearance of the extra horizontal lines. In fact, this doubled die has frequently been misattributed as the winner. This coin is not listed in any reference books. Now the reason for presenting the date area becomes apparent. The winner and this "impostor" are readily differentiated by looking at the date. Die cracks go in opposite directions at the date. The winner has the date centered well under the ball, while the impostor has the date shifted significantly to the right.